Walking up and down beaches with sampling gear during a heatwave may not be everyone’s ideal job but I wouldn’t want to be anywhere else. 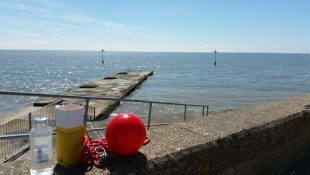 I am lucky that during the summer, my job consists of sampling the water quality along England’s longest coast – good old Essex! 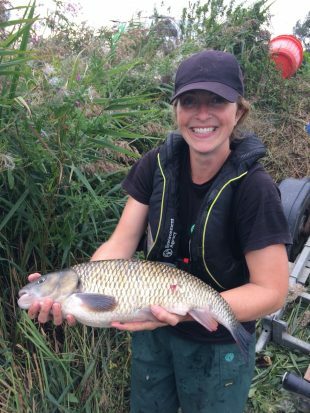 I have worked for the Environment Agency for 22 years and my current role is an environment officer in the Sampling and Collection team in the East Anglia area. I enjoy it for its varied nature, which changes with the seasons, and the fact that it means I’m outside most of the time. 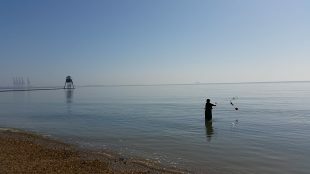 From May to September, it’s bathing water season so I’m regularly out sampling the water quality at the 10 different beaches in Essex along with my two other colleagues. I have to go about knee height into the sea and then fill the sample bottle by throwing it out on a secure line and letting it fill as it sinks. I then put the sample bottle in a fridge in my van where it remains until I get back to the depot and then it is taken by courier for analysis at our laboratory in Devon. The results are then collated and published on the Bathing Water Data Explorer website. The website has received a record number of visits this year. 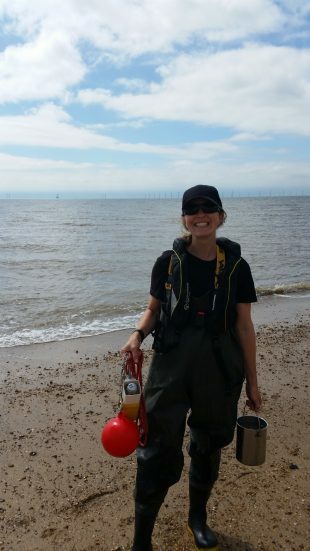 As well as collecting a sample of sea water, I also note down supporting information, such as the number of bathers and beach users, the salinity of the water, animal faeces, and litter. You do get asked a fair few questions by members of the public, who are interested to know what you are doing and I like to inform them about why we are doing it. Often people aren’t aware that we do this sort of work in the Environment Agency and I think it is good that they are able to see us as a very real presence on the ground. The work is quite demanding. Walking with sampling gear all day is quite tiring, especially in the heat so you definitely feel like you’ve done a day’s work afterwards. However, it is worth it for the chance of walking along the beautiful Essex coastline, which spans 350 miles. I don’t just sample bathing waters though. All year round I am out and about in my van collecting samples from rivers, boreholes and discharge points. Nationally we have over 10,000 designated sites in rivers, lakes, groundwaters and transitional and coastal waters as well as trade effluents and private works and this information is freely available to the public on our Open Data webpages. Every month we visit nearly 80 sites to take groundwater dip level readings. During the spring and autumn months I undertake invertebrate surveys in the river and collate supporting information on the aquatic plants present and land usage, among other things. From April to October I’m part of a team helping out with fish population surveys. We use electrofishing to stun and catch fish so that we can measure them and determine their age before returning them to the river. This data is used to monitor the health of the river ecosystem. I am pleased that the work me and my team do makes a real difference to the environment and it’s an added bonus that I get to do it all in the county that I’m proud to call home.